The Hercules DWP-75 Series rice polishers incorporate the most advanced water mist, double polishing roll design available in the marketplace. Due to the delicate polishing action produced by the inline double roll action and the humidity controlled mist, the degree of brightness and whiteness obtained by this machine is superior to any other polisher in the market. The combined humidity controlled mist and air cleans and improves the appearance and shelve life of milled rice. Traditional rice whitening machines create tiny groves and scratches to the surface of the grain. These imperfections trap and accumulate brand residues. The brand residues can deteriorate easily due to their oil content, reducing shelf life of the rice. 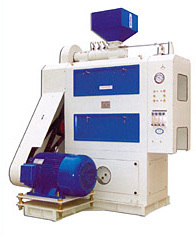 The Hercules Rice Polishers remove brand residues by injecting water mist into the milling chamber to improve quality and extend the shelf life of milled rice. The Hercules WP-16 Rice Polishing machine is a water mist polisher that combines air and water to polish, clean and improve the appearance of milled rice. Traditional rice whitening machines damage the surface of the rice, creating tiny grooves and scratches. These imperfections trap and hold bran residue which deteriorates the quality of the rice. The adhering residue can become rancid because the oil in the bran oxidizes. 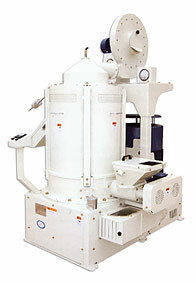 The Hercules Polisher removes this bran residue by injecting a water mist into the milling chamber. This improves shelf life for milled rice. The process also polishes the rice, smoothing out the grain surface which improves appearance and luster. The Hercules Vertical Friction Whitener VFW-10 achieves excellent whitening results by combining friction action whitening and water mist action polishing, all in a compact and efficient vertical machine. The friction action polishes the rice to a smooth polished finish. 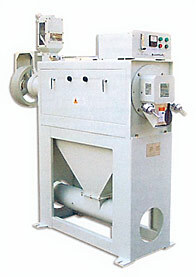 The water mist action provides highly effective bran removal keeping milling pressure low for higher whole grain yields. The New Hercules Vertical Rice Whitener Model VAW-10 features the latest technology in vertical rice whitening. It is ideal for a variety of rice whitening applications on all varieties of rice. It has one of the largest abrasive surfaces of any machine on the market. The machine also has a large throughput capacity and low internal pressure so the temperature of the grain is not elevated. 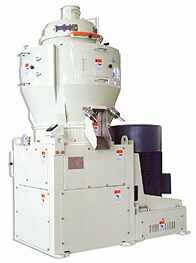 This combination allows for a gentle milling process with higher whole grain yields.